Born in Mexico City on April 24th, 1907. His mother died while giving birth to him, so he and his brother were raised by an aunt. He started formal art training by studying painting at the Academia de San Carlos, although he quickly found work as a photographer for the cinema industry. Early in his career he was given a scholarship to study in the US with Gregg Toland, the cinematographer for Citizen Kane. The first Mexican project he worked in was "Alla en el Rancho Grande" which earned him an award at the Venice Film Festival. This accolade made him as legendary as any of the star actors of the Golden Age of Mexican Cinema. As his fame grew, so did his political and social interests. He was one of the biggest supporters of the movie industry's labor unions. In 1993, director Alberto Isaac published "Conversaciones con Gabriel Figueroa", a documentary on this man's struggle to improve the conditions of workers in the Mexican movie business. 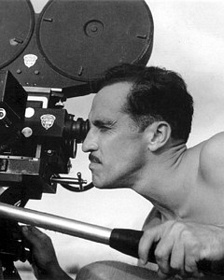 Figueroa also had a brief stint as a director that started one morning when John Houston had too much to drink during the filming on "The Night of the Iguana", he also won a Golden Globe for his work in "La Perla" and a Golden Palm for "Maria Candelaria". Gabriel Figueroa died in Coyoacan on April 27th, 1997, but will always be remembered as a defender of passionate creative liberty and an artist who through his lens, helped build what became the best age of cinema in Mexico.